Ants are often classed as a nuisance more than a pest, so why do we consider ants pests at all? 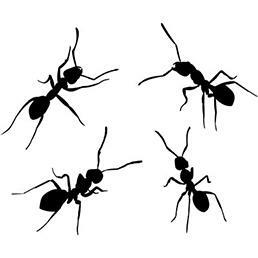 Below are just a few reasons why some clients class ants as pests. Small moulds of dirt from their excavations can be unsightly on garden paths, lawns and around skirting boards. Cracked pavers and driveways can be associated with ant tunnels. Ants trailing can be unsightly externally as well as internally. Plants can be damaged and ants feed on their seeds. Ants could also present a health risk. There are instances were Ants can carry disease organisms which can cause dysentery and a pathogenic bacterium’s including Salmonella. Ants are common scavengers and are on the lookout for food on your kitchen bench tops and food handling areas, but where were they before your kitchen? Garbage bins, pet excrement, rotting organic material and rotting flesh material! So their potential for disease transmission shouldn’t be ignored. Argentine Ant – Nest in exposed soil or in rotten logs. They will move indoors in wet weather. They prefer sweet foods but will eat insects, seeds and fruit. Coastal Brown Ant – Nest within building structures, wall cavities and behind skirting boards etc. They prefer food of the animal origin like dead insects, meat, fat and grease. White Footed House Ant – Nest anywhere, rockeries, paths, wall cavities etc. A general feeder. Black House Ant – Nest generally outside but also in subfloor areas. Again a general feeder. Nests can develop pretty quickly and activity levels will increase over the warmer months of spring – autumn. After Hours Pest Control Melbourne’s Ant treatments are designed to target the source of the problem and eradicate the NEST attacking your property at the time of treatment. Contact us for ant treatment details and an accurate price.